Alabama may be known as “The Heart of Dixie,” but it could just as easily be known as “The Heart of Doughnuts.” Throughout the state, doughnut shops large and small keep Alabamians spoiled with tasty treats. We’ve narrowed down the ever-growing list of doughnut shops to 10 of the very best. For an unforgettable doughnut experience, start with one of the following. The Heavenly Donut Company in Birmingham, Alabama, offers cake and yeast doughnuts, handmade every day. Yeast doughnut options include regular glazed, chocolate glazed, maple glazed, caramel glazed, maple bacon, sprinkles, strawberry iced, M&Ms, and more. Cake doughnuts come in blueberry triple chocolate, red velvet, sour cream old fashioned, chocolate covered sour cream, peanut butter chocolate, and the apple crisp variety. In addition, Heavenly Donuts serve bismarcks, beignets, and a different “Donut of the Day” most weekdays. Stop in for the most recent flavors, or track down the “Dough Rider” doughnut truck! Walk into City Donut in Orange Beach, Alabama, and take a whiff of the newest yeast and cake doughnuts, made-from-scratch every morning. The selection changes daily based on available ingredients, and inspiration, so make sure to stop by early. Enjoy the full coffee and espresso bar while you’re at it. Can’t make it in the morning? No problem. Stop by after 3 p.m. for frozen treats, in addition to doughnuts, coffee, and soft serve ice cream. 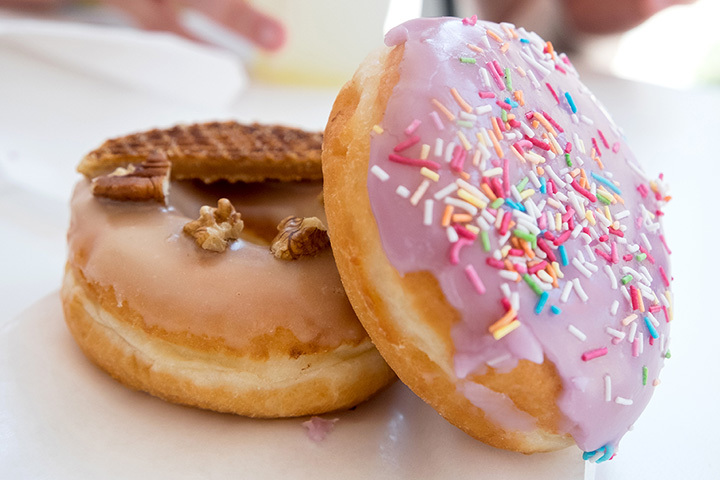 The Sugar Rush Donut Company has two convenient locations, one in Bayou and the other in West Mobile, Alabama. Each serves up delicious sweet treats each morning starting at 6 a.m. Take note: both locations are closed on Monday, and open an hour later, at 7 a.m., on the weekends. Try one of the Devil Food Cake doughnuts, a sour cream cake doughnut, or one of their incredible strawberry glaze. Donuts D Lite, with locations in Millbrook and Wetumpka, Alabama opens every Tuesday-Saturday at the staggeringly early 4:30 a.m. (but are closed Mondays), giving new meaning to the old adage, “time to make the doughnuts!” A mom-and-pop store, Donuts D Lite sells doughnuts, sausage kolaches, croissants, sausage and egg biscuits, and coffee. Stop by during the holidays for uniquely themed doughnuts. Donut Joe’s Alabama has quite the following. Founded in 2009, it’s said that customers sometimes follow Donut Joe’s employees home in order to steal their secret recipes! The first location in Pelham, Alabama, has prospered enough to support a second, now open in Gardendale, with more locations to come. Donut Joe’s bakes their doughnuts every morning and offers locally roasted coffee. Doughnut varieties include German chocolate, red velvet, blueberry, strawberry, old fashioned, caramel, and maple bacon doughnuts. Daylight Donuts is one of the most successful private doughnut enterprises in the world, with over 1,000 retail locations, many of which can be found across the state of Alabama. Since 1954, Daylight Donut has provided customers with some of the best doughnuts around. Specific doughnuts differ by the location, but you can always count on raised doughnuts, cake doughnuts, cinnamon rolls, sausage rolls, and Daylight Donut brand coffee whenever you stop by. Warehouse Bakery and Donuts in Fairhope, Alabama is much more than a simple doughnut shop. Owner Jennifer Haffner opened Warehouse in 2015, and has since created an “eclectic menu, with items like the infamous Squeelin’ Pig breakfast biscuit…” as well as doughnuts. Choose from the breakfast, lunch, dinner, bakery, or catering menu. The doughnut menu changes daily, with $.85 glazed doughnuts the only staple. Come on in and see what they’ve got baking today. D Square Donuts in Auburn, Alabama is the recipient of the Opelika-Auburn News Readers’ Choice Award for “Best Donuts” and “Local Bakery” 2013, 2014, and 2015. It’s easy to see why. D Square makes being square cool again, with their unique square-shaped doughnuts. Sixteen flavors are available daily, including maple bacon, old fashioned cake, key lime filled, tiger stripes, and more. Daily specials keep the menu fresh, with a new treat available Tuesday-Sunday. Getting a Bigfoot’s Little Donut might feel as difficult as catching Bigfoot, but trust us, it’s worth it. Bigfoot’s is anything but traditional. Open only Thursday-Saturday, the baker is situated in a decommissioned train car. The menu is eclectic, offering “gourmet mini-doughnuts,” such as the funnel cake doughnut, cream cheese and chocolate doughnut, honey and cinnamon sugar, and many more. Try out the Biggy’s Flapjack Donuts, especially the maple syrup flapjack. Don’t forget to ask about specials. Hero Donuts is the new kid on the block, offering incredible doughnut delights throughout the Birmingham area at its regular pop-up shops. The doughnuts are Brioche-style, with ever-changing flavors. At the time of writing, the available flavors include Boston creme, lemon curd, caramel custard, vanilla, chocolate, blood orange, sugar and spice, lemon cardamom, maple sea salt, and whiskey sorghum. It’s best to place a pre-order around two days ahead of time to ensure you’ll receive all of your favorite doughnuts.